The Brazilian Air Force maintenance personnel gathered beneath the island crane and rear anti-aircraft guns. Photo taken from starboard side looking aft. These photographs were taken between 14th and 16th August 1990. Aircraft taxing into position in preparation for take-off. 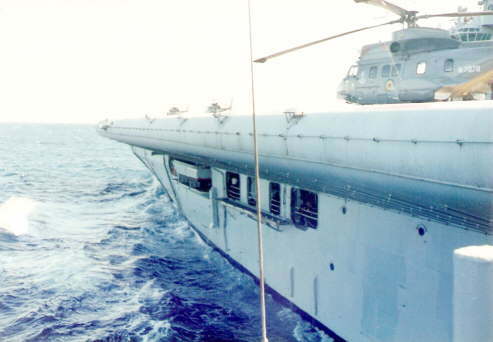 Photo taken from starboard side looking aft. 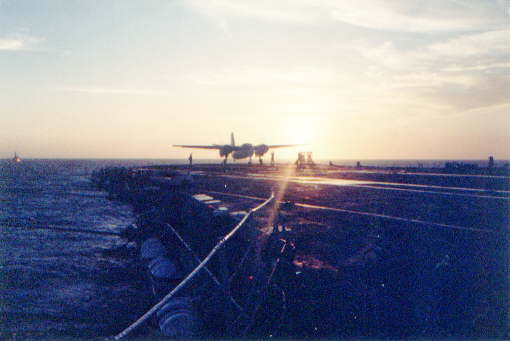 Aircraft turning to line up on flight deck ready for take-off. Photo taken from starboard side looking aft. 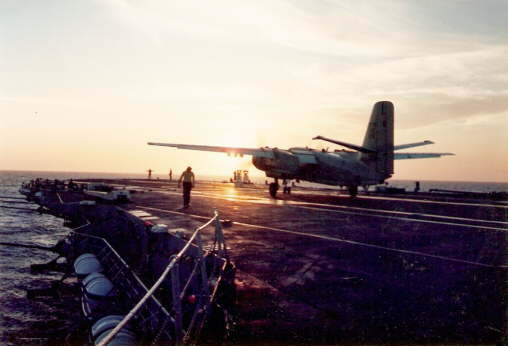 Aircraft lined up on flight deck awaiting take-off. 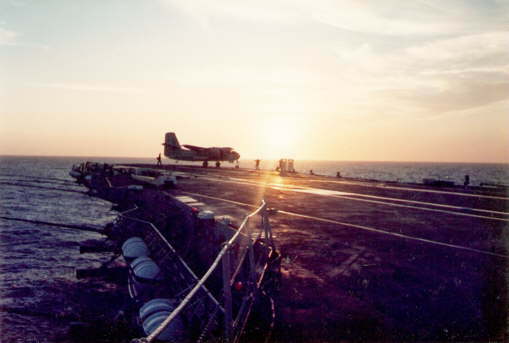 The sun highlights the deck landing apparatus. 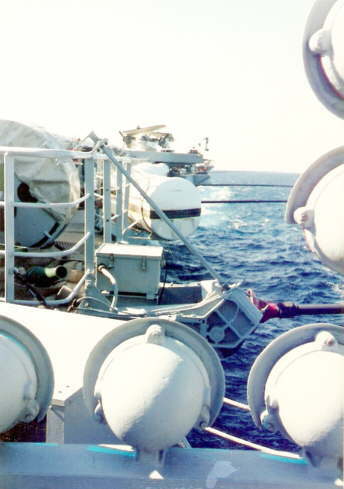 Photo taken from starboard side looking aft. 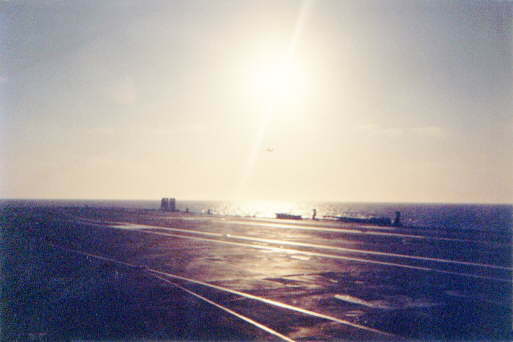 Aircraft approaching the ship, just above the sun. 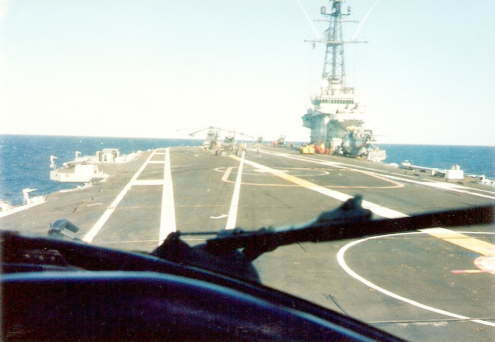 Photo taken from starboard side looking aft. 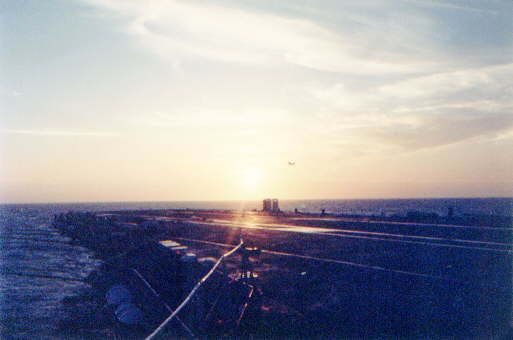 Aircraft making final approach for landing on. 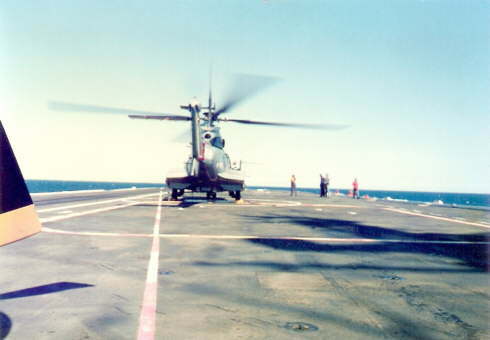 The last landing of the Brazilian Navy's Super Puma N-7072 in September 1990. 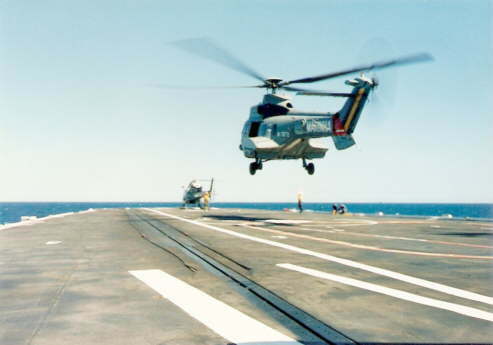 The last take-off of the Brazilian Navy's Super Puma N-7072 in September 1990. Photo taken from the Mirror sponson on the Port side looking forward. 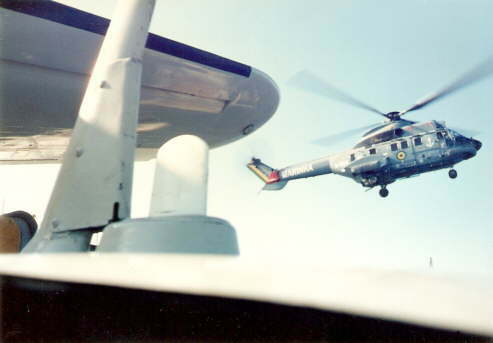 The Brazilian Navy's Super Puma N-7072 in foreground. This photo was taken from behind the landing mirror and is framed by it's 'cut' lights (the red vertical) and reference lights (blue horizontal ones). After them there is the crank mechanism that raises and lowers the deck edge antennae. After that is the 40mm. AA gun sponson. The P-16 parked was No.7032. Photo taken Port side looking aft. This photo was taken from the 7032 co-pilot's seat. Note the incoming deck party, which means an helicopter is approaching. 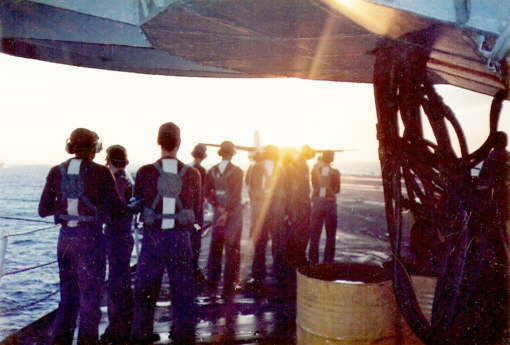 This photo was taken through the co-pilot's emergency hatch of the P-16.